Pumpkin is the essence of Fall. Of course, it’s not fall anymore, but the Pumpkin Spice Latte never gets old. Also, now that Christmas drinks have replaced the PSL in Starbucks, here’s a way to get a fix with an added twist. In a saucepan combine milk, sweetener and spices on medium to high heat. Bring to a boil, reduce heat and simmer until fragrant. Strain. In a blender, combine the milk with pumpkin puree and rum. 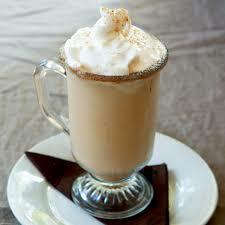 Blend until emulsified and top with whipped topping and garnish with cinnamon stick. Serve and enjoy! My favorite Autumn drink, making my taste bud so happy!